MacDougall joins the national team as the lone rookie this season after a strong collegiate campaign for High Point University. As a sophomore, Calgary’s MacDougall captured the Big South Conference Championship by a convincing six strokes and added four top-20 results for the Panthers. 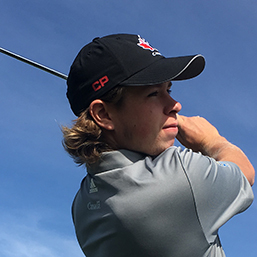 He followed his collegiate season with a T16 result at the 2018 Canadian Men’s Amateur and a victory at the Alberta Match Play Championship. In 2016, MacDougall lost in a playoff at the Future Links, driven by Acura Western Championship. Watching golf when I was young, maybe two or three years old, I would try to copy the swings of pros on TV. Small dot underneath the number and a line through the Titleist. I have an 18 year-old sister, Mady. “The Lucifer Effect” by Philip Zimbardo. A picture of the beach at Kiawah Island. I always use the tails side of a coin to mark my ball.